Here are the links to the quilters I talked about in my podcast. Check them out if you get the chance. I also include a link to my guild, if you are in the Mid Mi area stop by. See the picture on the previous posts. More babies are on the way so I have been busy quilting. Here is a picture of my latest quilting panel. I just love the fun I have working on these little project. My control is improving but I need to improve my starts and stops as I tend to have a bit of a thread nest to deal with. 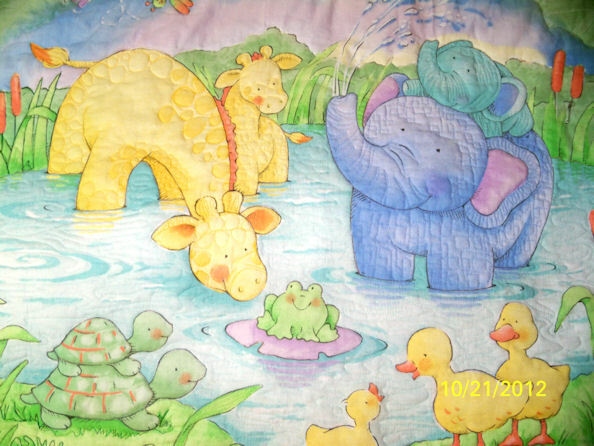 This is the panel I selected for my niece’s baby due in March. I lucked out by picking a panel by chance that will blend with her nursery decorations. I think it is very sweet. I have selected a blue piping and a yellow strip for the border. 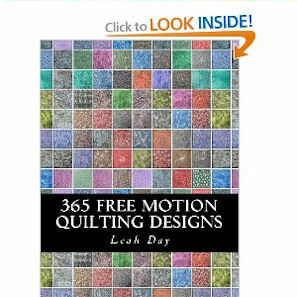 This is a close up of the free motion quilting. I am using Leah Day’s book for some of the motifs. I am trying to make the motifs larger so that the quilt stays soft and cuddly. I tend to OVER QUILT and make my FMQ too dense resulting in a stiff quilt. 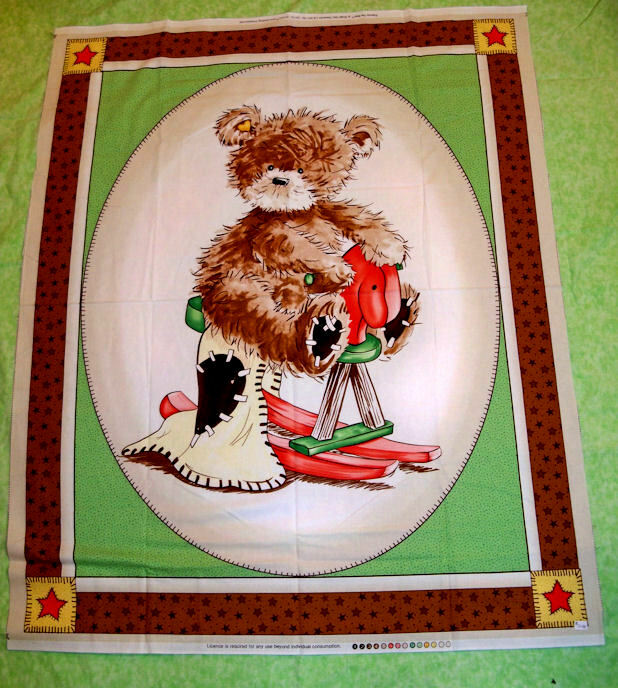 The batting I selected is puffier/ loftier then the quilt I have used in the past. This is the backing of the quilt top. YOU might be able to see some of my crummy starts and stops. I forget to bring up the bobbin thread when I start quilting, so I get thread nest I later have to fix. I have been burying my knots, but I am also trying the tiny stitch method. MY next panel for the next baby. It is so darn cute!!! I bought this last panel when I popped into my local quilt shop last week. I just thought it was adorable. 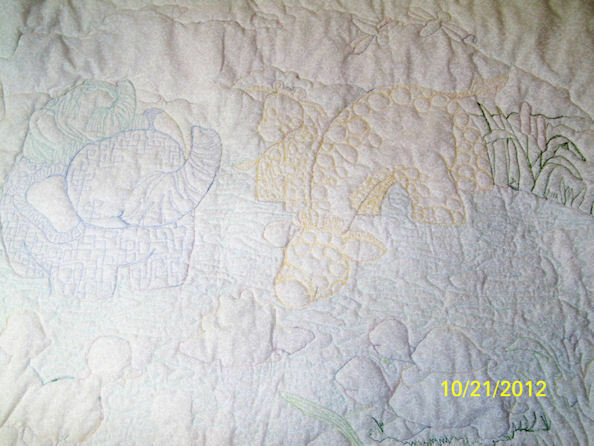 I hope to do some trupunto style quilting in area of the panel. 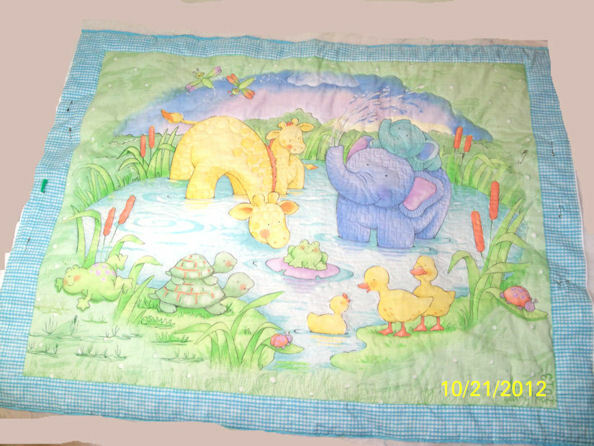 My husband’s best friend just had a grand-baby and I plan to send them this for Christmas…… I had better get quilting.